Published on February 25, 2010 by Wade Shepard Follow me on Twitter here. 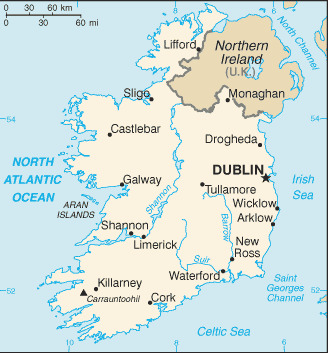 Submit information and links about how to obtain travel visas to Ireland. How did you get your Ireland visa? Contribute information below to help other travelers. Does travel to Ireland count towards my Schengen total? Hello! I am on a US passport and currently have a german 1 year residence/work visa through my German wife we live in Stuttgart. I have until end of october to renew it. I am wanting to do an apprenticeship course for building in the republic of ireland for 4 1/2 months starting in may. when entering Ireland will I get a stamp for a schengen 90 day visa or since i have a resident permit in schengen country will things be different. I dont want to overstay officially but wondering how i can make this work. I know if i flew into belfast I get a 6 month uk visa and I could drive to republic of ireland. I also dont know if i get stamped flying from germany into the republic, so things could be simpler than i think. I dont want to mess up my schengen status since i will be renewing my residence permit end of october. how can i do this, i dont have time to do a work visa for ireland. thanks, also i have friends in scotland so i thought about visiting them for a week than taking a ferry to northern ireland and than driving to republic hopefully with a local. No worries, Ireland is not a part of the Schengen zone — they still have their own immigration system in place, and your time there will not count towards your Schengen total. Why are you adverse to getting stamped into the Republic of Ireland? They will give you 90 days upon entry, and if you want to stay for a month longer you may be able to get an extension — or just leave and return. This is by far a safer option than trying to slip across the border. If you want to exit from Cork, they will check your passport and this could mean big trouble if you don’t have an entry stamp. Previous post: Travel Insurance – Is it Really Worth the Money?